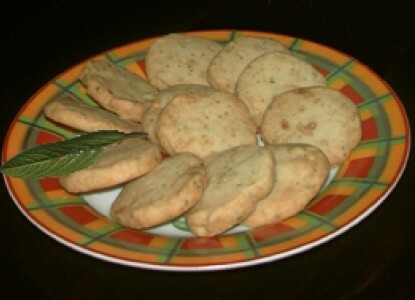 Created for the 2011 Inn to Inn Herb Tour, these savory bites are great for brunch, afternoon tea, or with a glass of wine as an aperitif. Blend first 4 ingredients briefly in food processor. Use 2 tablespoons sage for lightly scented flavor; more for a stronger herb taste. Cut butter into 1/2-inch-thick pieces Add butter to processor bowl; using on/off turns, process until dough comes together. Turn out into bowl and mix in toasted pine nuts. Divide dough in half. Shape each dough piece into log about 1 1/2 inches in diameter. Chill until firm enough to slice, about 30 minutes. Preheat oven to 350°F. Cut each chilled log into 1/3- to 1/2-inch-thick rounds; place on parchment-lined baking sheets. Bake approximately 18-22 minutes or until cookies are golden. Cool on racks.